Jeffrey Welch's Blog: Can Dogs Eat Onions? If Your Dog Ate Onions, What Do You Do? The post Can Dogs Eat Onions? If Your Dog Ate Onions, What Do You Do? by Sassafras Lowrey appeared first on Dogster. Copying over entire articles infringes on copyright laws. You may not be aware of it, but all of these articles were assigned, contracted and paid for, so they aren’t considered public domain. However, we appreciate that you like the article and would love it if you continued sharing just the first paragraph of an article, then linking out to the rest of the piece on Dogster.com. Onions are unique members of the root vegetable family because they (like garlic) are bulbs and do not grow as deeply as other root vegetables. Onions come in white, yellow and red bulbs, as well as chives and leeks, and are a common flavorful addition to meals and side dishes, served both cooked and raw. They help bring flavor to many of our favorite dishes, but can dogs eat onions? If your dog ate onions, what do you do? 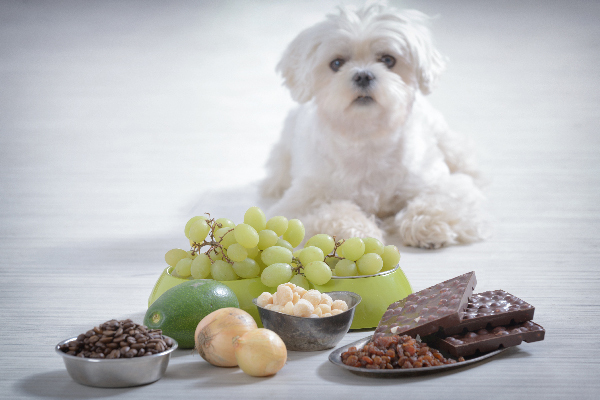 Grapes, chocolates, onions and other some other humans foods are toxic to dogs. Photography ©humonia | iStock / Getty Images Plus. Most lists of human foods toxic to dogs include onions. We spoke with Emmy-award winning veterinarian Dr. Jeff Werber to learn more about how dangerous onions are for our dogs. Dr. Jeff explains that while onions aren’t great for dogs, they might not be quite as bad for them as most of us thought. “Traditionally, we have always recommended avoiding raw onions and raw garlic because of a type of toxin that can have a negative effect on red blood cells,” Dr. Werber confirms. So, can dogs eat onions? Well, you shouldn’t give your dog a bowl of onions to snack on. Onions aren’t healthy for dogs, but unlike grapes, where even a small amount can be toxic, onion toxicity depends on how much of an onion a dog consumes. “We have found that a dog would have to ingest a very large amount for it to become a problem,” Dr. Werber advises. However, one of the dangers of onions and dogs is that the toxins can build up in their system, meaning that they could slowly be reaching a point where an onion exposure could get them sick, or that there might be what Dr. Werber calls a cumulative effect. “To be safe, avoid onions and garlic,” Dr. Werber suggests. Consuming onions can lead to dogs developing a condition called hemolytic anemia. This condition impacts/destroys a dog’s red blood cells, leaving dogs without enough of them for healthy functioning. Severe onion poisoning in dogs can be fatal. What should you do if your dog ate onions? To be safe, keep all onions and all products containing onions away from your dogs. But, what happens if you’re cooking and you drop a slice of onion on the floor or a friend shares a bite of their lunch with your dog and it includes onion? While we don’t want our dogs eating onions, having a bite of something with onion isn’t likely to make your dog sick. “Your dog probably would not eat enough to cause a real problem because dogs typically don’t like the taste,” Dr. Werber says. If you think your dog ate onions in large quantities, or if your dog seems like he isn’t feeling well, Dr. Werber suggests seeking immediate veterinary care. Your veterinarian will be able to evaluate your dog and determine if any treatment is necessary. Thumbnail: Photography © vvuls | iStock / Getty Images Plus. This piece was originally published on May 4, 2018.